Yes... I know it's January 20th. Christmas is long gone... and forget about tree trimming. That was ages ago. But as I uploaded and edited photos that were collecting cobwebs in my camera I decided "heck with it... I'm posting them anyway." On the bright side... I missed the overload of Christmas posts... so now I can pretend I'm special. Ana seemed to be thrilled at the fact that she was participating in the decorating. 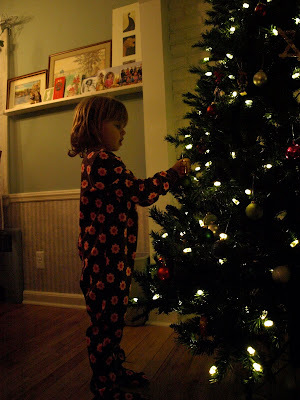 I think in the beginning she thought she might be able to climb the tree. That isn't really surprising since she climbs absolutely everything else lately. 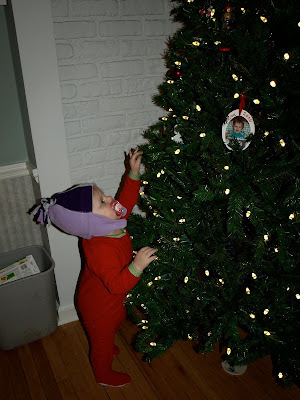 Ana insisted on wearing her hat the entire time we were decorating. I took it off a couple times and she immediately leaned her head over to me yelling "hat, hat, hat" so I would put it back on. The combination of the hat, that face, and that pot belly are almost too much to bear. Zoe took decorating VERY seriously this year. 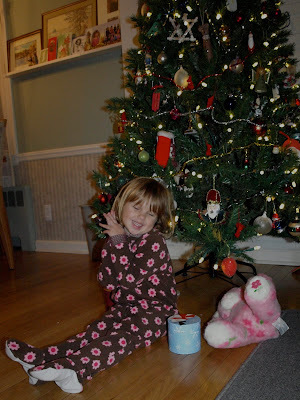 I think she would have been happy if we let her decorate the whole tree by herself. She definitely didn't like Ana's version of decorating... which was to put a pile in a "hole" in the tree. Zoe spent a bit of her time redistributing Ana's efforts. "Isn't the tree I decorated just LOVELY?" 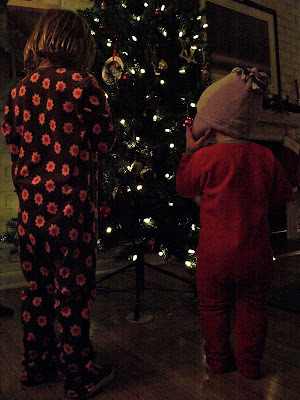 Christmas 2009... the first year we decorated the tree with all 4 family members participating... and we lived to tell about it!